WJA Attorneys Secure a $25.1 Million Whistleblower Retaliation Verdict - One of the Largest in California History. Discrimination & Harassment Have you been discriminated against or harassed at work? Call us now to explore your rights and options. Wage & Hour Disputes Are you getting paid overtime? Meal and rest breaks? Contact us to find out what you're entitled to. Wrongful Termination & Retaliation Have you been fired? Call us right away to find out if you have a claim. Medical Leave & Accommodations State and Federal laws protect you while on a medical leave. We have the knowledge and experience that can help. Other cases involving Family and Medical Leave Act (“FMLA”),California Family Rights Act (“ CFRA”) and Pregnancy Disability Leave Law (“PDLL”) and layoff/severance negotiations. California labor and employment law is very complex and constantly evolving. Thus, you should seek a dedicated employment lawyer will use all available options to obtain the best possible result on your behalf. Workplace Justice Advocates deals only in employment matters and our attorneys have extensive experience litigating employment cases against all types of employers – from small, closely held businesses to large Fortune 500 companies. Unlike the vast majority of lawyers and law firms, our attorneys aggressively push cases towards trial and have developed a strong reputation for obtaining large seven and eight-figure wrongful termination verdicts. Most recently, our trial attorneys at Workplace Justice Advocates have obtained one of the largest single-plaintiff whistleblower verdicts in California history at $25.1 Million Dollars by a 12-0 unanimous jury. In addition, our attorneys are all active members of the California Employment Lawyers Association (“CELA”) and the Consumer Attorneys Association of Los Angeles ("CAALA"), which offer numerous resources that keep our employment attorneys sharp, well-trained and up-to-date on the most recent trends and developments in California employment law. Most employers have massive resources at their disposal when it comes to fighting employment lawsuits, which is why you should find a Los Angeles employment attorney who can aggressively pursue your claim and take your case to trial if necessary. 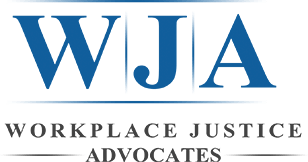 Our employment attorneys at Workplace Justice Advocates have consistently achieved excellent results on behalf of our clients by leveraging our experience and uncompromising work ethic. With the above in mind, please be aware that our firm is very selective in the cases we decide to take. We do not operate on a large-volume or high-turnover business model, nor are we a referral service – if we take your case, we will be your attorneys. We choose to invest significant amounts of time and effort into every case in order to maximize the results for our clients. Our firm takes a much greater risk under this approach, which is why we expect full, honest and prompt communication from our clients. We only represent honest clients who have had their rights violated and deserve immediate justice. If you've been unlawfully harmed by your employer call or email us today to get started on your case. Our Los Angeles employment lawyers work primarily on a contingency basis, which means no upfront charges until we achieve a successful result. Our attorneys have vast experience litigating complex employment cases in both State and Federal District courts, including the California Court of Appeal, the California Supreme Court and, most recently, the United States Supreme Court. With the above in mind, our attorneys have built a powerful reputation in the legal community as steadfast advocates who are dedicated to the pursuit of justice. Since 2013 alone, Workplace Justice Advocates has successfully recovered over $30 Million Dollars verdicts and settlements on behalf of wronged employees. Our employment attorneys at Workplace Justice Advocates work tirelessly to build the strongest possible case for each of our clients. Attorney Tamara S. Freeze is fluent in English and Russian and our other staff are fluent in Spanish, Mandarin and Taiwanese. We offer a free phone consultation to all prospective clients and flexible fee arrangements. We serve clients throughout Southern California including Orange County, Los Angeles, and San Diego. Our offices are conveniently located in Irvine, Beverly Hills, and San Diego. All free consultations are over-the-phone, not in-person. We do not give legal advice over the phone. If an attorney believes you may have a case, we will schedule a more in-depth, in-person meeting at one of our office locations to discuss the details of your case. As stated above, we are very selective in the cases that we take and we decline the vast majority of potential cases that we evaluate. If we do not take your case, this does not mean that you do not have a claim. Please do NOT send our attorneys any files or documents unless asked to do so. Please note that certain deadlines apply to your potential claims and you should consult with an attorney as soon as possible. All cases are based on merit and we do not and cannot guarantee any result. Any of the verdicts or settlements reported on this website are for informational purposes only and do not represent the value of all cases. Each case is evaluated based on the specific facts of that case and no two cases are identical. We do not disclose any value or potential value of your case, as this is nearly impossible to determine without knowing all of the facts involved, including, but not limited to, all of the defenses and potential defenses, the legal claims, case venue, judge and/or makeup of the jury in addition to dozens of other factors that remain unknown until the litigation and/or trial of a typical case. This website is for informational purposes only and does not constitute legal advice or create an attorney-client relationship. Likewise, visiting this website or contacting our firm does not automatically create an attorney-client relationship. An attorney-client relationship will only be established after you and the firm execute a written attorney-client agreement for legal services. This website is not designed for children under the age of 13. By submitting a contact form, you consent to having your contact information, including your name, phone number, address and IP address stored and sent to the firm in order to allow our attorneys and staff to contact you about your potential case.